Cost Effective Solutions for Your Stamping & Manufacturing Needs. 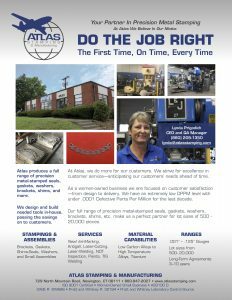 For custom metal stampings, prototype parts, and more, customers from all areas of industry turn to Atlas Stamping and Manufacturing. We deliver high-quality, high performance components that meet your exact requirements. Request a quote for the precision metal stampings you need, or contact us today to get started on your next project.